The name says it all. You have to be wild and barbaric in this online multiplayer game. 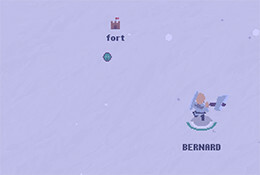 Equipped with pre-historic weapons, a player has to crush his enemy and rule the combat field. With increased number of kills you will become more and more powerful. Not only that, you will be awarded with gold coins and rewards that will help you power up. There are different modes of Wilds io. These are Fort, Arena, Browars, Football and Practice mode. In the Fort mode, you will be assigned to a team. The target of a team is to capture the fort. Whoever does it first, will be declared the winner! The Arena mode is where you will have to face an opponent of your rank and power. And you will have to fight to death with each other. Whoever kills the other first will be the winner. It is a one on one combat fight. Browars is similar except there are two pairs fighting against each other. You will be in a team of 2 and have to finish off your opponent team. The Football mode is also a combative one while the practice mode is simply where you can gain training for the cut-throat war zone. A table on the right of the screen exhibits player names and rankings. There is also an option to zoom in or out of the screen for better visibility. By holding the right key of the mouse you can run in the field. The left key is used to attack the opponent. If you want to jump, simple press the spacebar. By pressing F, you can throw your weapon towards your opponent from a large distance. So, join in now in this epic medieval themed game and become the number 1 feared huntsman! As mentioned earlier, you have to become the most majestic and powerful huntsman of the field.